Honestly, I never listen to the radio. I don't even like the radio and prefer to listen to my tapes and CDs. DJ's can be so annoying and I find they spoil my concentration. 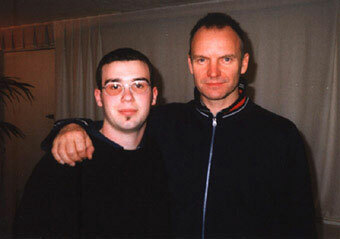 I will always be grateful to the radio though, as it only through NRJ (a very popular French broadcaster) that I was able to realise my dream and meet Sting. It all began in November 1996. My friend Magali knew how much I loved Sting (All my friends know how much I love Sting) and contacted me as soon as she heard that NRJ was holding a Sting competition. The first prize was a backstage pass for Sting's 22nd December concert in Montepellier, an opportunity to take part in the pre concert sound check and best of all, an interview with Sting. Unfortunately Magali didn't know what you had to do to enter the competition and I had to tune in to NRJ for two days before I heard the next announcement. It was easy though, and all you had to do was send in the questions you would like to ask Sting. Anyway, I already had lots of questions and I'd listened to enough of Sting's earlier interviews to know the questions he'd never been asked. I worked really hard on putting it all together and even read other artist interviews for a few extra ideas. The Peter Buck of REM and Elliot Murphy interview/conversation was particularly useful. When I'd finally decided on my questions, I listed them in a special promotional card for the Summoners magazine and included a brief description of myself, a devoted Sting fan. I didn't really believe I could win but I knew my questions were interesting and perhaps I stood a chance?